Yes it’s us again… You know, Mama the chaps who play Genesis for you guys. 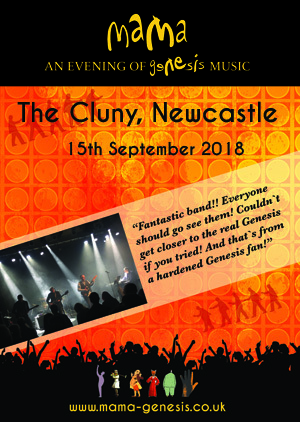 We just thought we would let you know what has been happening during our summer break and remind you that we start the Autumn and Winter shows next month with a welcome return to The Cluny in Newcastle followed by the second visit this year to the Floral Pavilion in New Brighton. First off, why have we been so quiet? Well apart from the usual summer holidays, the fact is that we all have other musical projects on the go outside of Mama which we’ve been busy with. John W and Dave have just appeared on an album by The Swan Chorus which has just been released on Bandcamp as a digital download. For those of you who are asking when the CD is out, please be patient. The band is looking at the response to the download before it makes a decision. If we get enough interest then a very limited edition may follow with extra demo’s and suchlike. John and Dave hope you enjoy the album. Dave has been up to Plenty! Dave has been involved in several projects. 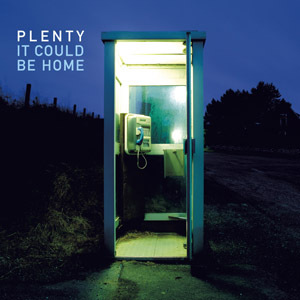 The Plenty album he recorded with Tim Bowness & Brian Hulse came out in April on Karisma Records, called “It Could Be Home”. It is available on download, CD and vinyl. Finally he has been rehearsing with Nerve Toy Trio in preparation for their appearance at the Marsden Jazz Festival in October. Not enough prog for you? Here’s more! 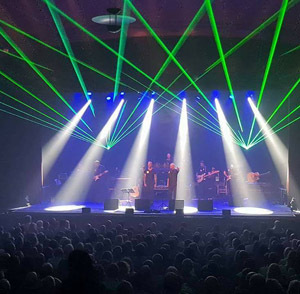 John C and JV have been involved with Pink Floyd tribute Vesbim Floyd and a performance of Tommy by The Who recently at the New Brighton Floral Pavilion, both of which were very successful indeed. More shows are planned for later this year and in 2019. Now… Have we forgotten anything? Well yes actually. You may remember the chap who used to give us “three minutes of sheer thunder,” one James Archibald Cooper? Well James left the band in 2017 and we are pleased to say that he has been blackmailed into returning full time for us starting immediately. Mama would like to thank Tim Rothwell for all his hard work and wish him all the best for the future. And the more likely reason that we haven’t updated the website recently? Probably the fact that the webmaster has been rather busy working on some other projects, the newest of which is The Comedy Circus. 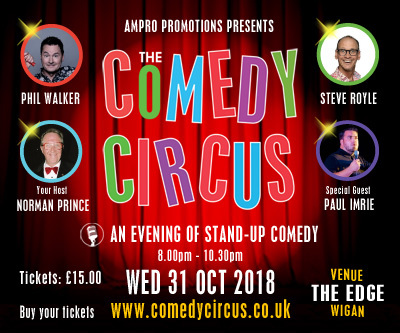 The launch show will be held at a brand new venue in Wigan called The Edge on the 31st October and it will feature four very talented stand-up comedians. So there you have it. We’ve got new songs in the pipeline for 2019 as we need a set list revamp (post your ideas below). We also hope to be releasing a double live CD next year and we do have some swanky new T shirts for sale at our shows. STOP PRESS: A rather exciting mystery project popped up on our radar. Mama have been asked to get involved in recording an album, details of which we cannot tell you at the moment. But hopefully we will explain all before the end of 2018….